Hey friends! Today I’m excited to share a wonderful recipe and a great new cookbook with you. 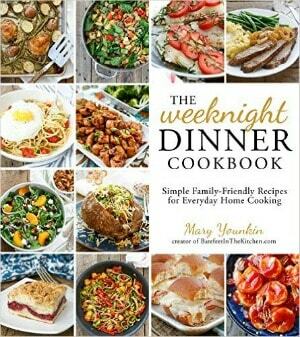 My friend, Mary, at Barefeet in The Kitchen, has come out with her own cookbook, The Weeknight Dinner Cookbook, and it’s got me excited! Her ideas are fresh, family friendly, and delicious. While flipping through this book I didn’t find any recipes that I already make, but tons of new ones that jumped out at my taste buds. The main thing, though, is that nothing felt “weird” to me – and if you cook for a family you know what I’m talking about! I asked Mary if I could share her Crunchy Honey Lime Chicken and I wasn’t at all surprised when she graciously agreed. I know you’ll enjoy “meeting” her as much as I enjoy knowing her! You can learn more about this cookbook or get your own copy by clicking here. 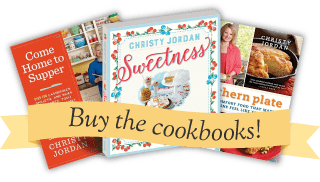 See more of my favorite cookbooks on my Favorite Cookbooks Page by clicking here. In a bowl, whisk together flour, chili powder,salt, pepper, and cayenne. Add egg and milk and whisk until smooth. Add chicken tenders to the flour mixture and stir to coat well. Place panko bread crumbs in a separate medium sized bowl. Dip each chicken tender in the bread crumbs and then place on a plate. To pan fry: Warm oil in a large skillet over medium high heat. Once the oil is hot, carefully add chicken to skillet in small batches and let cook, undisturbed, for two minutes, or until lightly browned. Flip and repeat with the other side until chicken is fully cooked and no longer pink in the center. Repeat until all tenders are done. To make in oven: Preheat oven to 425. Set a wire rack over a rimmed baking sheet and lightly grease with oil or cooking spray. Place crumb coated chicken strips on wire rack. Spray liberally with olive oil spray. Bake for 10 minutes, or until chicken is cooked through. Note: The crumb coating won't brown when cooked this way but will still be delicious! Transfer chicken to plate. 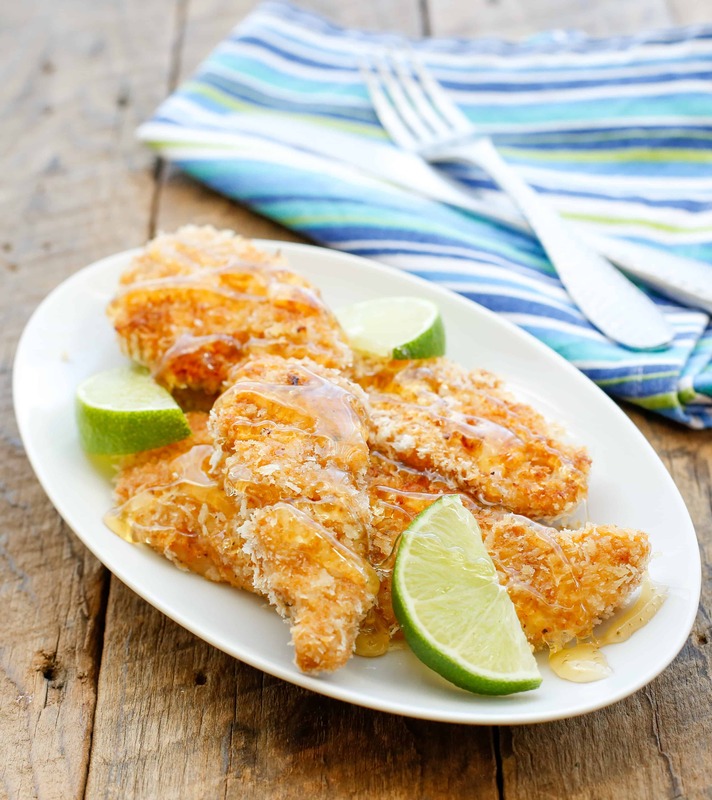 Squeeze lime wedges over chicken and drizzle with honey just before serving. I’m thrilled that you’re enjoying the cookbook, Christy! This chicken is one of my personal favorites too. Thanks so much! Just checking to see if you would know the carb count on these. Sounds great!!! Anyway to make this dish carb friendly? It looks delicious. Well, Christy, it also has flour and honey. I guess the 2T milk wouldn’t blow the recipe too much. Would almond flour work? Have you found anything that can substitute for the honey? I’m so new to low carb, but like the above poster, I’d like to try this. Thanks for your help. Almond flour should work fine for what it is used for here, but try to get a finely ground almond flour. As far as the honey, I have no idea – maybe agave? I’m not sure. This is one of those recipes that I, personally, would enjoy as it for a treat or settle on making it lower carb by using the pork rinds in place of bread crumbs. You can leave the crust ingredients off, and make what my Mom called “Broasted Chicken”. Season your chicken pieces (bone-in or boneless) with salt (I use 1 teaspoon per pound of meat), garlic powder (again, 1 teaspoon per pound of meat), and some cayenne pepper. Fry it like you would fried chicken. Yum! I forgot to mention, that my way is for low carb, since EL Greene was inquiring about low carb. The original recipe looks delicious, though. Wanted thank you for the Scripture Writing Plan each month. This new adventure is bringing me great joy. First thing in the morning, the process sets the tone for my day. It’s true that small things can create great change. What a wonderful blessing! Thanks, Christy. I am so glad you are enjoying the plan each month Cindy!! It is one of the things I look forward to the most each day because as you said, it sets the tone for the rest of the day! Christy will you do a cookbook with healthy recipes? Looks very good. I will have to try this for sure. I wanted to share this on facebook, but instead of a picture of the recipe it says “301 Moved Permanently”. That happens when I hit your facebook button as well as when I copy and paste the URL. Thank you so much for letting me know! This is the result of moving to a new server today. We are working on it now and I really appreciate you calling or attention to the problem. Hopefully it will be fixed soon. Oh my goodness, I have to agree, that is about the best compliment any cook can get!!! When grandma approves you know it was good! !